The New Mexico Museum of Art (NMMA) was conceived of before New Mexico became a State in 1912. 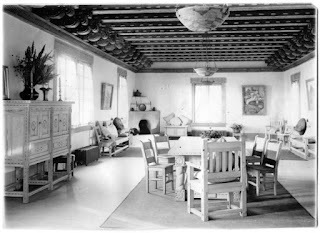 One of the results of the building was to identify the Santa Fe Style but that story is for another day. Northern New Mexico was a large draw for artists from the East who came for health reasons. Several sanatoriums for TB patients existed and for foreign artists as well who were attracted to the striking beauty of the South West. Edgar Lee Hewitt (1865-1946), an archeologist and anthropologist, made his mark on the National scene in his work on the Antiquities Act of 1906 but his passion for archeology led him to become the director of the School of American Archeology, today known as the School for Advanced Research in Santa Fe. Hewitt was clearly an ambitious man with his finger in many pies during his long career and he was determined to promote the arts in New Mexico and bring culture to the residents of the State. 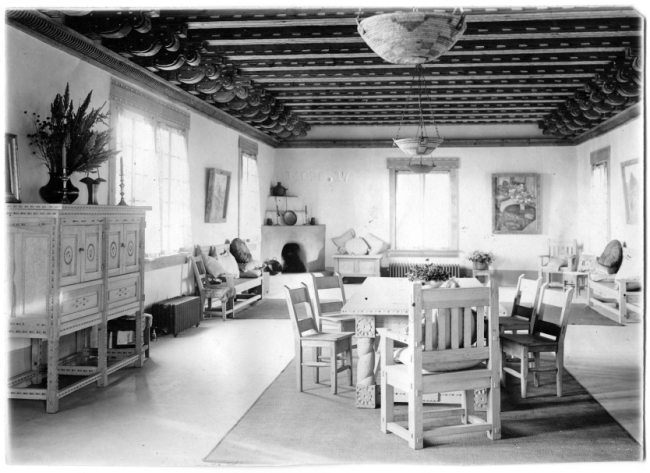 Already, in 1909 he founded the Museum of New Mexico in the Palace of the Governors where he began holding art shows but realized the region needed a proper art gallery to show off the work of the local artists. Hewitt himself was responsible for the building that was created for the art Museum. He commissioned areas for specific purposes. Realizing that the women in the town actually controlled what was going to go on culturally in Santa Fe he built the grandest room on the second floor just for them and called it “The Women’s Board Room.” It was actually more of a club where the ladies could have their teas and entertain the important men of the town such as the legislators. If it still functioned today I am sure there would be a number of lobbyists in the mix. A large part of the Museum is devoted to a church like structure that was actually a meeting hall, where to this day, lectures and concerts take place. Most of all, however, Hewitt wanted spaces in which to exhibit the work of all ‘his artists’. When you walk past the courtyard and into the ground floor exhibition space the first areas that you see are a series of alcoves. In fact, since there was no permanent collection the entire ground floor consisted of alcoves. The purpose of the alcoves was to give artists individual spaces in which they could show their art for specified periods of time. Today, however, some of these alcoves have been converted into standard exhibition galleries where part of the permanent collection can always be on view. Also, in recent years an addition to the building was tacked on for special exhibitions and this has taken away from the original focus on those alcoves. As part of its celebration of the centenary of New Mexico Statehood the Art Museum is recreating these Alcove shows. The Alcoves that still exist in the museum are reserved for one year for a selected group of artists from New Mexico. There will be 5-week rotations allowing for 5 artists at a time, making room for a total of 45 artists who will be able to exhibit in all different media. This is not the first time that the original purpose of the museum has been revisited. It has been done many times before. The big difference is that originally when Hewitt knew all the artists in town he promoted an open door policy where artists could sign up to have an alcove. Since the Museum’s original incarnation many more artists have settled in Santa Fe and throughout New Mexico, so in recent times the shows have been curated by professional curators picking the artists and monitoring what is being exhibited in the Alcoves. They still must be, however, New Mexico artists showing work pertinent to this part of the world and preferably created within the last 3 years. In this centennial year and leading up to the centennial of the Museum in 1917 the return of the art gallery spaces to the original Alcove Show format is a wonderful way of acknowledging the contribution made by the current generation of artists in a historical context.